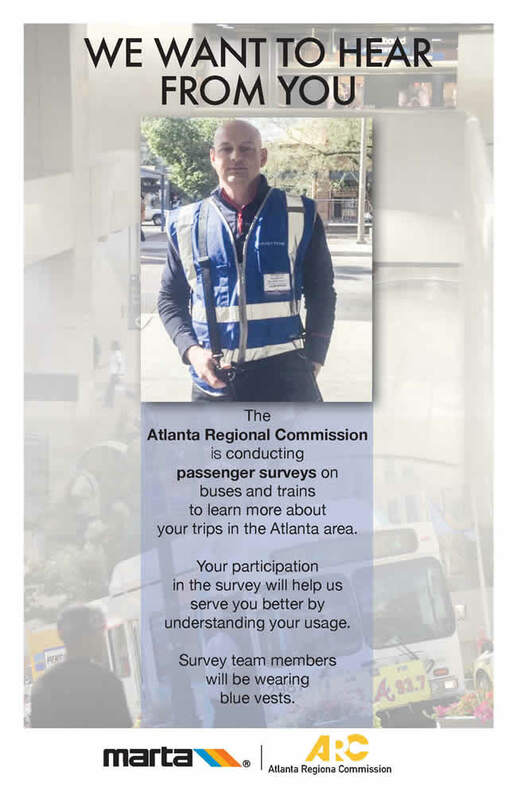 The Atlanta Regional Commission (ARC) is conducting a survey onboard all fixed bus and rail routes in the region from March to December 2019 to inform transit planning. During this period, there will be two individual studies conducted. 1) An On-to-Off count will be conducted which involves survey staff distributing cards to boarding passengers and asking the passengers to hold on to that card until they exit the vehicle. 2) Interviewers with tablet computers will ask randomly selected passengers questions about their transit trips. ARC is responsible for developing and updating the Atlanta Region’s Plan, a long-range blueprint that details the investments needed to ensure metro Atlanta’s future success and improve the region’s quality of life. For further details, please refer to the frequently asked questions below. What is the Onboard Transit Passenger Survey? 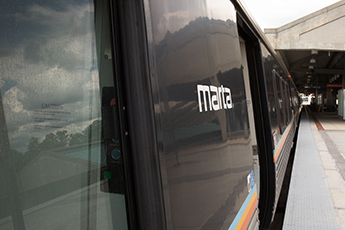 The survey is a study of how people use transit to travel in the Greater Atlanta area. Questions focus on trip behavior and demographics. Your responses will help the ARC understand travel patterns and choices of transit riders. This information will be used to plan transit infrastructure improvements and service planning. It will also be used determine where passengers board and get off vehicles. How often are these studies performed and why now? Onboard transit passenger studies are typically conducted every few years. The last survey was conducted by ARC in 2009. Since that time, transit service and individual travel patterns have changed. ARC hired a contractor to conduct the onboard transit passenger survey. The people you see on the buses and trains administering the surveys are contracted employees. The data, however, belongs to ARC. Survey staff will provide you with a card once you board the bus and ask you to hold onto the card until you exit the bus. When you exit the bus, please return your card to the surveyor located in the back of the bus. Surveyors will be easy to identify by their blue vest and surveyor badge. This will allow for a better understanding of passenger flows through the transit system, and for survey data expansion. Interviewers with tablet computers will randomly select passengers to take the survey. (The tablet computer tells the interviewer who to pick based on a random number formula.) Random selection is necessary to ensure that the data are statistically valid. While volunteers are not allowed to take the survey, we appreciate your participation if you are selected. For commuter routes, survey staff will distribute a paper version of the survey in order for the passenger to self-complete the survey and return the filled out questionnaire back to the surveyor on the bus. All the passenger does is hold onto the card you were provided and return it once you get off the bus. Your individual survey will take five to seven minutes to complete. Why do you need to ask about personal information such as income? What does that have to do with how I use transit? ARC is required to collect specific demographic data about passengers including race, household income, and language proficiency in order to comply with Title VI of the Civil Rights Act of 1964. This information is submitted to the Federal Transit Administration (FTA) approximately every five years. Also, studies have shown that certain household characteristics, such as income, are key indicators of travel behavior. By understanding these relationships, planners are able to better predict how recommended service improvements will perform. Please keep in mind that personal information is removed from all records and the results are aggregated, a measure that ensures your privacy and anonymity. What if I am asked to participate in the survey more than once? If you are selected more than once, we would appreciate your participation each time you are selected. How will I know that the interviewer is legitimate? Official survey staff members wear a uniform consisting of a blue vest and an official surveyor badge. They carry tablet computers and will never ask you for information such as your social security number or bank account information. What if I have a complaint or a concern about a specific interviewer? Please note a description of the interviewer, and email the provided contact at the email below. Please include all relevant information (date/time/location of encounter, reason for concern), so that the matter can be investigated. Is the survey available online? No. Since the survey asks about the specific transit trip, only passengers who are on transit on the survey day are being selected for interviews. Are people with disabilities included in the survey? Yes. All persons riding transit during the survey period are included in the random selection methodology. Interviewers can assist customers with disabilities in completing the survey or provide the option to complete it later by phone. Is the survey available in other languages? Yes. Bilingual staff will be available on transit where they are most likely to be needed. Additionally, customers speaking other languages can choose to complete the survey later by phone in their respective language. How will these data be reported? Published reports will summarize the survey data, but will not disclose Personally Identifiable Information (PII). Will I have access to the data or the final findings? A summary report will be available when the study is complete in 2020. Is the data shared with or sold to anyone other than ARC? No. To ensure the anonymity of survey respondents, personal information will not be included in the final data files. Will my route be eliminated or changed based on my information? This information will allow transit providers to implement enhancements to the system that make it more effective, reliable, and efficient. The ultimate goal is to better meet travelers’ needs. Surveying of all transit lines is expected to be finished by December 2019. ARC receives transportation planning funds from the federal government that are being used to pay for the survey. How do I know that my personal information is safe? The survey consultant and ARC are required to protect the confidentiality of personally identifiable information (PII). Key provisions include storing PII on secure computers, protecting it from unauthorized use, and destroying PII after an agreed-upon time period. Also, as previously noted, published reports will summarize the survey data, but will not disclose PII. Who can I contact to get more information on the study?